Whoever holds this hammer, if he be worthy, shall possess the power of THOR! Now you can wield the power of Thor to open a cool refreshing beverage with this solid metal bottle opener shaped like the Asgardian Avenger's legendary Uru hammer, Mjolnir! 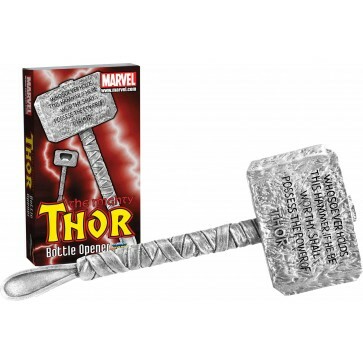 It measures six inches from the hammer's head to the end of the handle, so you won't need super strength to lift it! Comes packaged in a full-color wrap encompassing a deluxe collector's case.